We love Thomas and Friends in our house so I'm excited to share with you the latest DVD special, "Go Go Thomas". We loved this action packed DVD filled with 5 special episodes of Thomas & Friends. You can select the "play all" option which comes with little comedy sketches staring Perkins and Archie between each episode! We really liked the introduction of Stafford, the electric engine and of course, Flynn is a recent favourite already having seen him in a previous Thomas special. The DVD extras are lovely, with a choice of two singalong tracks, a puzzle game, (which my two enjoy) and a short about what happens at the end of the line featuring a real steam train. It's my 20month old Daughter, Meg who is the biggest Thomas fan in our house! We actually bought her a Thomas toy at christmas so she didn't have to keep taking her brother's one! Although my 3 year old boy also loves Thomas, it's Meg who keeps requesting Thomas to be on! Thomas and his friends are charged up and ready to Go, Go! Thomas shows Gordon that being quick is as useful as being strong, while Flynn, the fire engine, learns to put his pride aside and race to the rescue. Thomas causes some trouble on the tracks trying to be a model engine for a new photographer, while Spencer’s on the move, ignoring warnings about electric engine Stafford’s battery. Thomas pumps his pistons to Misty Island to help fix Ol’ Wheezy. Will the number one blue engine be on track and on time? Ready, Set… Go, Go Thomas! 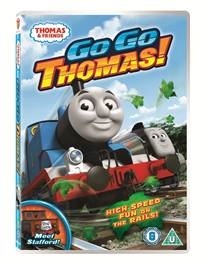 I'm lucky enough to have been offered a copy of "Go Go Thomas" DVD for one of my lovely readers. To enter the competition, please leave a comment below telling me your favourite Thomas & Friends character, don't forget to include a way for me to contact you if you are the winner, such as twitter id or email please. Competition will close on Monday 25th March 2013 at 12noon. One winner will be selected using random.org, please reply with your details within 7days of winning or another winner will be selected. Thank you to everyone who entered. This competition has now closed. I love your competitions. Colin and Rohan both love Thomas. The favourite one is still Thomas of course, followed by Percy. I personally love James, probably because of the colour, then Igor. C hates Diesel 10.....anyway, this is really it. So favourite is still Thomas as boring as it sounds. Has to be Thomas himself - we love James too though ! I love Cranky the crane and Harold the helicopter! The kids love Thomas. ThomasLand is awesome!